What Lin-Manuel’s Hamilton can teach us about Politics in the Church. 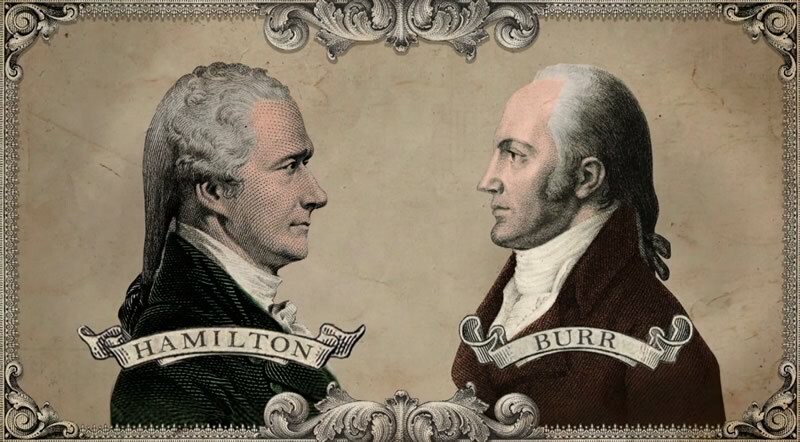 The quintessential conflict in Lin Manuel Miranda’s Broadway musical Hamilton is between Alexander Hamilton and Aaron Burr. Like oil and water, from the first scene to the last, they are polar opposites in personality and approach to life. Hamilton names who he is and what he believes, often to great extent. He writes everything, speaks at length about his convictions, and leaves no question about who he is and believes. Burr does not engage in divisiveness and doesn’t make statements with unfettered convictions. Burr changes parties and runs against friends when politically expedient, and indeed when he is running for President, he has support from both parties in the lead-up to it. This same conflict between naming one’s convictions and not engaging in divisive statements, I would say, is also present in the Church. “Why do you always say what you believe? / Why do you always say what you believe? For some churches, engaging in political discourse or controversial topics is anathema to their mission. While the leadership and population may be aligned on some controversial topics, they don’t make it a point of discussion. I would call these churches Aaron Burr churches, as the mantra of Aaron Burr is to be political but not divisive. They do not like the idea of being lost in the tumult of business and ambition that does not enliven their spirits or keep people away from their worship services. Osteen explained that his core message is helping people let go of their pasts, reach their dreams, have a healthy self-image and raise good children. While homosexuality is part of addressing life issues, the pastor said he doesn’t want to be defined by his views on the issue. So naming convictions on controversial social issues is not part of these churches. And to be clear: this isn’t a slam on these Aaron Burr churches. Engagement in charity and poverty justice issues come easily to these types of churches, even if political activism does not, so they do good work even if they exempt themselves from some areas of human need. At the other end of the spectrum is the very clear political rhetoric of other churches, both conservative and progressive. Engagement in social issues comes easily to these Hamilton churches. These are the churches with lists of affirmations and beliefs on their websites, or who wear proudly the names of their minority movements in their denominations (like Reconciling churches within United Methodism that are open and affirming to LGBTQ persons). While the content of the sermons are not mean-spirited or unnecessarily partisan, there’s no question of the pastor’s politics or the church leadership’s politics. For example, I haven’t made any Trump jokes or really any references the past few months, but I have spoken against the racist and sexist culture that Trump is championing. My church also participates in immigration rallies, ecumenical solidarity, and other actions that Hamilton progressive churches live into. Finally, African-American churches tap into this identity strongly as they speak with conviction on the issues that matter to their flocks. Hamilton Churches can feel isolating to folks who are not in the majority opinion. When a church is 60/40, minority perspectives feel able to speak up and be heard. When an issue is settled (for instance, my church would never rescind their 1993 vote to become Reconciling–and it was over 90% then), then there’s little use to even bring it up. I know what this feels like–both as a pastor and former laity in the pew–to have a minority perspective, and it can be frustrating to feel like you are so far in the minority that speaking up is just useless. But Hamilton Churches do speak up, regardless of their placement in the majority or minority of their denomination or region, because speaking clearly with conviction is a value of theirs, and they are able to enter political conversations and social witness with effective well-trained voices to shape public opinion, at the cost of the enormity of membership (often). The final straw for Hamilton and Burr was the election of 1800 when Hamilton endorsed Burr’s opponent Thomas Jefferson even though Hamilton hated Jefferson, they weren’t in the same party, and they rarely found a single thing to agree on. The rationale for Hamilton’s surprising decision? I don’t make the same analogy here to Burr and Hamilton churches, as I’m focused more on the expression of their beliefs than the content of them. But I do wonder if there’s a sense that naming one’s convictions is more important than hiding them. One of my convictions is to live out Cornel West’s line: “justice is love in public.” So when pastors say “I’m not political” as to why they won’t engage in controversial discussions, what I hear is “I don’t love you enough to publicly acknowledge violations of your well-being.” And that doesn’t feel right to me when it comes down to the choice of standing up for people or sitting down to be more accessible to people. I’m on the side of being a Hamilton church, though I recognize the value of sitting in the middle. The conversations you are able to have with diversity of opinions are invaluable, but I believe that when people’s lives are at stake, one has a moral obligation to speak up. What kind of church did you grow up in? Hamilton or Burr? What kind of church do you affiliate with now? Hamilton or Burr? What are points of reconciliation between Hamilton and Burr churches to help them work better together, rather than duel themselves to death? Thanks for reading and for your shares on social media. A lot of WCA churches & pastors fall into the Hamilton camp for sure. The model certainly includes any church that is clear and bold about their political and social beliefs. Churches are a lot like families – they are not homogenous; attending a family reunion or holiday gathering is all the proof you need. Local churches may have differing political and social beliefs among their congregants, but still have a shared vision for discipleship and mission – and be bold in doing so. I could point to at least 15-20 churches in the district I serve who fit this description. I think you’re describing a false dichotomy. The dichotomy is about the expression of their beliefs, not the makeup of them. Would a church you describe make a public statement about immigration or marriage equality? If no, Burr. If yes, Hamilton. Has nothing to do with discipleship or mission, other than Hamilton churches believe such public statements are part of their mission. I’m guess I’m confused on why you think some (not all) churches would feel a need to make such a public statement on immigration and marriage equality, when there are already denominational statements on such. Ah. It’s less Methodist-centric than that (the Burr church example is non-denominational). But even in what you describe, public statements draw from denominational statements but don’t just regurgitate them or say “our beliefs on the Cleveland Indians are in this book” but offer more content. The question is whether the church will even make such a statement at all from either the pastor or leadership. That impetus to speak up or not is what I’m writing about. Churches can’t be all things to all people- trying to has helped with our decline. And people in my daughter’s generation don’t want to hear politics in the pulpit or the fellowship hall. They want to see a local church doing something outside the walls – and don’t see the need to bring up their differences of opinion in which there is ultimately a stalemate and no clear answer. But feeding a hungry body or soul, or assisting them with shelter from weather or storms of life – they get that. Like you, I’ve met people in your daughters generation (not mine yet–oldest is 4) who do want to hear statements of conviction and action to help the marginalized with justice, not just the poor with charity. We get there together, Burr churches that eschew politics and Hamilton churches that speak into them. It seems to me that the church was once a place where people could share opinions, even opposing opinions, without being made to feel that one idea was better than another. In recent decades, it seems that we have lost the grace to live in the tension of differing opinions. Now it feels as if everyone must be convinced that one way is right, while another is wrong. I’m not sure that is what the church is meant to be. I don’t see how the church can “transform the world” if it cannot endure the variety of opinions that dwell within its walls. While you’re certainly describing the Church at certain points and in certain places, I don’t think it’s right to say that the Church has always, until now, been a place where people politely agreed to disagree. If you like at the history of Christianity, this was seldom the case. In Acts, you have a big Church debate over whether or not the Gentiles need to be circumcised. That council did not end with a, “Well, we acknowledge that we disagree on this. The important thing is we all love Jesus.” It ended with a firm declaration of what is right, and that meant that some were wrong. And that isn’t something exclusive to Apostolic times. If you look at the First Council of Nicea, Arius’ refusal to believe that Christ was truly God led St. Nicholas to hit him in the face. And after Arius died (according to legend, by his bowels opening up), you had Nicene Christians claiming it was an act of God that led to Arius’ death. Throughout the whole history of the Church, there have been schisms – and they’ve generally occurred precisely because people felt the issue was too important to say that people can disagree on it and still be good Christians. After the Council of Ephesus, which denounced the teachings of Nestorius, you had a break in the Church. Neither the Church of the East (which was outside of Roman borders) nor the Roman Church (not referring to the Roman Catholic Church, but rather the Church within the Roman Empire) believed that the teachings of Nestorius were something that a believer could hold their own opinion on. There was a split (and a similar split occurred after Chalcedon). Then we can look to the Reformation and see that people had wildly diverging views, and they didn’t just accept that it’s OK to believe differently. They didn’t even part on amicable terms (as anyone who’s read any of the hundreds of creative and biting insults Luther directed at the Papacy). And this continued afterward as well, to the time of Wesley. Wesley had far from kind things to say about Catholics – even though he accepted that the Catholics were Christians. And, in the history of Methodism in America, one can look at slavery. Certainly there were Methodists who had no real stand on slavery. But there were far more who believed it was either a manifest evil, or who believed it was a part of the divine order of creation. One cannot accept that both positions are just as good as one another. One, or both, of the parties are wrong. And so, in 1844, the Methodists in America divided along this issue. Some things, certainly, we should be able to hold in tension, and not denounce either belief. Because some things aren’t that important. But there are many, many things which are manifestly wrong or right – and what you believe has a real impact on how you behave. And how you behave is fundamental to the question of whether or not you are acting as a disciple of Christ. Certainly, today, there are many who will quickly and easily dismiss those who disagree with them. Often, they do it in rather disgusting, de-humanizing ways. Christians shouldn’t act that way. But to pretend that we can all just get along, and what we believe doesn’t matter, isn’t the appropriate Christian response. We have one Gospel. How we respond to that Gospel matters. I love this!! I grew up in a Hamilton church. From 3rd grade, immediately post-merger, until 29. It was wonderful on a personal & church level. You knew what the church wanted of us, you knew where each other personally stood & you found common ground from there – and respect for differing opinions. My next church home, for almost 20 years, was a Burr church. Missions and secrets seemed to be the lay of the land. No one spoke their personal opinion on things, including those who were delegates to GC. It was frustrating!! I can respect you more if I know where you stand, whether it is on homosexuality & the church or worship attendance – why the secrecy? Now I’m at a Reconciling church that is very much a Hamilton church, from politics to inclusivity, whether racial in the late 50s to LGBTQ persons in the early 90s to homelessness for almost that same range of time. Grace is always offered along with respect to differing opinions (on any topic). It is so refreshing to be in a church where you know where you and others stand. I have a co-worker also at a Hamilton church on the other end of the spectrum from my own – Good News/Confessing/WCA. They too are clear in where they stand and their focus. Yet at the same time, they and we, are strongly oriented to mission work. But because both churches are Hamiltons, a seeker can choose the one that calls to their own core beliefs. And isn’t that what we all really want?